So there's this new show on Bravo called "Pregnant in Heels" starring this darling British girl named Rosie Pope. She is something called a "maternity concierge" to rich people in New York City. This show is BANANAS. Absolute crazy town. These people are out of their minds. Now, some of the stuff is just Rosie helping people baby-proof their homes or what not, but some of these people hire her to help pick a baby name. And by "help pick a baby name" I mean HIRE A FOCUS GROUP FROM A MAJOR ADVERTISING AGENCY TO SIT AROUND AND DISCUSS YOUR BABY NAMES. Seriously. But, I'm addicted. Crazy town. 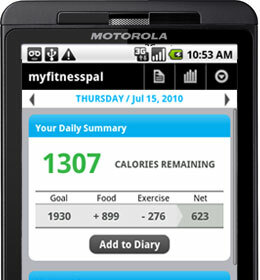 This is one of the things that is more "new to me" but I downloaded an app on my phone called "My Fitness Pal". It sets up a calorie plan for you and you type in what you've eaten all day and it will tell you how many calories you have left. 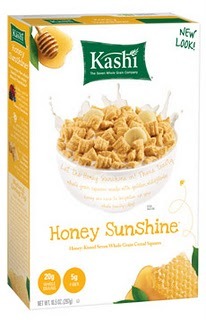 One thing that is helping me keep the calories down is this new Kashi cereal, Honey Sunshine. Warning: While it may look like Cap'n Crunch, IT MOST CERTAINLY DOES NOT TASTE LIKE IT. Now, we all love etsy.com. You know, the site where people can sell their homemade items. 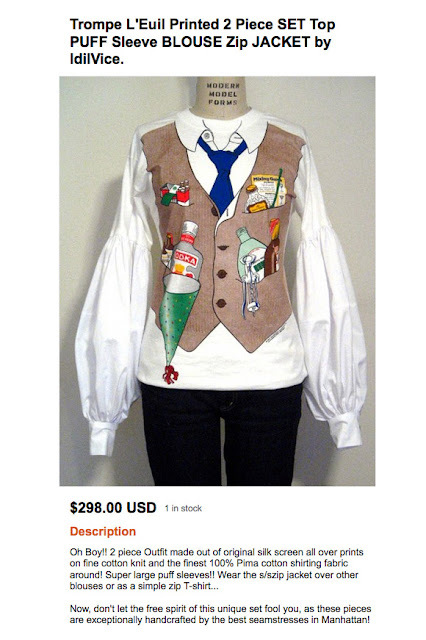 It's really a genius idea and some people like my sister go a bit nuts with etsy. I've recently found a site called Regretsy that illustrates the times when Etsy goes wrong. Very, very wrong. 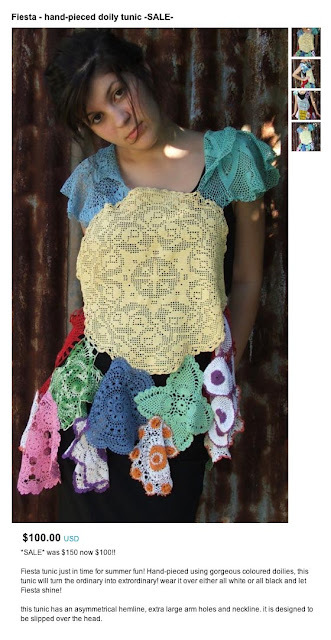 I mean, who wouldn't want to wear this dress made out of doilies? 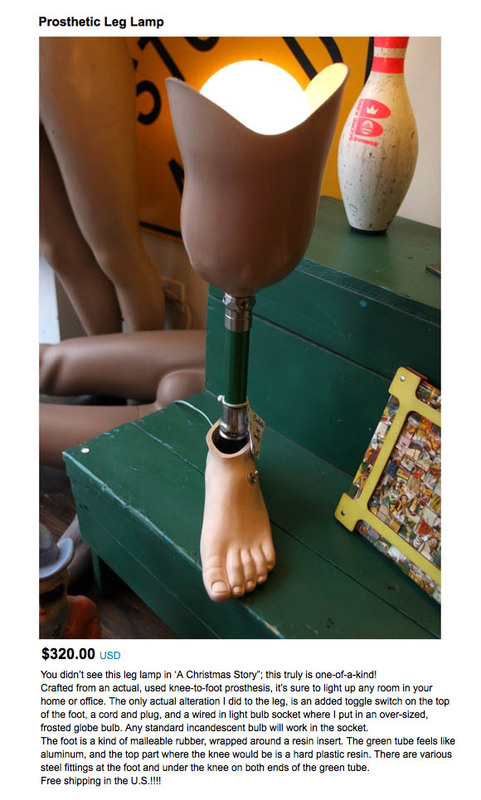 And, just in time for Mother's Day, this Prosthetic Leg Lamp can be yours for only $320.00. We all have that person in our life that this shirt/vest/puffed sleeved blouse would be PERFECT for!! 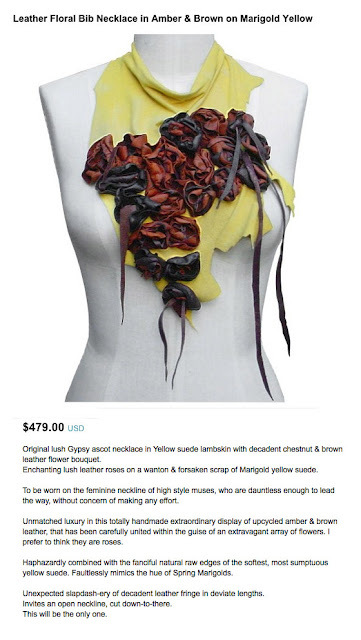 For $479 you can BET YOUR SWEET BIFFY that I'll be purchasing this Floral Bib Necklace. I'm just sad I didn't see it in time for Easter! So anyway, those are some new things in my life. What's new in yours? 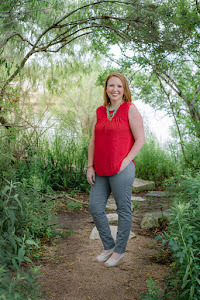 In preparation for summer, I've found 2 new products I LOVE! 1. St Ives Cellulite Shield Advanced Body Moisturizer. Now, I don't know how much this really helps with cellulite, but if you want the softest skin EVER and a lotion that smells yummy while also possibly helping with cellulite, buy this! Oh my, I love it! 2. Dove Energy Glow Lotion with self tanner. As a pasty white girl, I love this stuff! Subtle color but enough to not make me transparent. Plus, it doesn't smell like a self tanner. Again, LOVE this stuff! I'm going to have to check out that pregnant show...I think it would be great to be a pregnancy coordinator!! !